I now blog on chapter five of my book. This passage is usually interpreted as God’s precious promise for faithful prayer. The interpretation usually goes something like this. If you really believe with all your heart, whatever you ask God will be done for you. One little problem! This kind of promise hardly ever gets fulfilled, and how in fact do you measure how much faith is enough? The clue to the right interpretation comes out of the analogy in Jesus’ miracle of the fig tree. The tree was cursed much like the mountain being moved. This was Jesus logic. In other words, whatever the fig represented for Jesus and his world would point to what kind of mountain Jesus was talking about (11.21-23). Another clue about the meaning is the discussion on prayer. Jesus did talk about prayer within the context of this event in 11.17. Therefore, if we were to look at this event as part of the event of Jesus’ entry into Jerusalem, Jesus did not mean prayer in general but a specific kind of prayer within specific context and architectural structure. These are the clues Mark had left us when he recorded this story. Its message is then not really about prayer but about the greater context of Mark 11. It was a message about temple and what happened to the temple institution. My book will give more definitive answer as to the meaning of this passage and how it applies to modern faith community. The Pharisees have become a byword for hypocrisy in our modern society. Yet, I’m often reminded (in a friendly way, of course) by my Jewish friends that the Pharisees were not so bad and were actually the good guys back in the first century. We only need to read a few Jewish commentaries and some first-century sources to realize that the portrait of the Pharisees was uneven. What can we make of it? Many books have been written on this topic. I don’t see myself being able to solve this problem, but I wish to sample a text, Mark 2.23-27, in this blog to look at the characterization of the Pharisees not as a historical record a means to a message. The story had Jesus and His disciples picking heads of grain in the field because they were hungry. Then, the Pharisees were pointing out that the action was performed on the Sabbath. Jesus then cited David as an example that sometimes exceptions were good. I’m not going to go through the whole story, but just want to point out one thing. One commentator, Lawrence Willis, in The Jewish Annotated New Testament, mentioned that this record was not accurate because Pharisees would simply not be out on a Sabbath spying on Jesus. I suppose that is one explanation, but I thought of a different explanation. Can we presuppose that all the Pharisees hated Jesus equally? I think that would be an overstatement. Is it more reasonable to assume that when Mark was talking, he was talking about one particular group of Pharisees whose hatred for Jesus was so severe that they were doing the unthinkable on the Sabbath? I think it is more reasonable to see the general term “Pharisees” in Mark to refer to a smaller but very vocal and even powerful group. This group would be out walking around on the Sabbath spying on Jesus instead of keeping Sabbath themselves. The irony is that by pointing out the breaking of Sabbath in their religious zeal, their action was also questionable with a view of the Sabbath law. This group would continue to follow Jesus asking Him insincere questions to trap Him (e.g. Mk. 7.5-7; 8.11) while connecting with the gentile rulers (Mk. 8.14) to cause Jesus’ eventual death. The group of Pharisees was not Mark’s message. Neither was Mark trying to represent the entire historical reality. Rather, this group was his literary foil to talk about his real message. What then was the real message? Mark’s portrait of the Pharisees was not really just about hypocrisy or about anti-Pharisees. Instead, he used the portrait to show that there were religious people whose occupation with their own agenda was so strong that they were willing to break their own principles to accomplish their deeds. So many religious people are willing to break their own integrity to accomplish their own agenda today. Mark still speaks today. Mark 10.35-52 – More information, more wisdom? Mark 10 is part of my work for my book on Mark. Have you ever noticed that people quote proof texts to prove their points? In narrative, proof texts nearly cannot prove anything we want it to say. We do however see some repeated key phrases within the same author’s writing worth noting. In this installment, I will show how biblical authors can use unrelated accounts but using similar vocabulary to make a comparison in order to convey a message. Of great interest is the pairing of the disciples’ request and the healing of Bartimaeus. These two unrelated stories are interesting in that Mark used some of the same vocabulary to show that the Bartimaeus story did not just follow the disciples’ request sequentially but that there is a lesson to be learned here. In this blog, I only wish to focus on one aspect: Jesus’ question. I read an article that points to the same question being asked twice. This got me thinking. Mk. 10.36 has Jesus asking the disciples “What do you want me to do for you?” after the disciples demanded Jesus to grant them their request as if they were in charge. In fact, the outcome of the story shows that they had more misunderstandings about Jesus, as Jesus did not grant them their request. In the story of Bartimaeus, Jesus asked the same question in Mk. 10.51, “What do you want me to do for you?” Jesus then granted healing to the blind man. The results are the contrast in the two stories. The blind man probably investigated about Jesus before he shouted for Jesus to help him. What is the contrast? Throughout Mark, the disciples were rebuked by Jesus because, quite often, their requests were unreasonably ignorant. Yet, by now, they were approaching Jerusalem with Jesus. They had followed Jesus all these three years. The blind man did not. Yet, Jesus granted the blind man his wishes. Surely, Jesus taught the disciples more information, at least much more than the information the blind man gathered. What is this contrast trying to teach us? The question “What do you want me to do for you” is really not about what Jesus could do for His followers, at least not in Mark. Mark took the question towards a different direction of revealing about the disciples’ understanding. Mark seems to be saying that more information does not equal to understanding. The result of the healing has the healed Bartimaeus following Jesus. Even with incomplete information, he was able to follow Jesus, no less than the disciples. Perhaps the formerly blind man was just lucky. Who knows, but the fact remains that Jesus granted his request. The question “What do you want me to do for you?” does not try to solicit information as much as exposing people’s understanding or misunderstanding about God. Disciples had all the information but lacked understanding. The blind man had some information but luckily got the right understanding. The lesson is clear. You don’t need all the information to get it right some of the time. 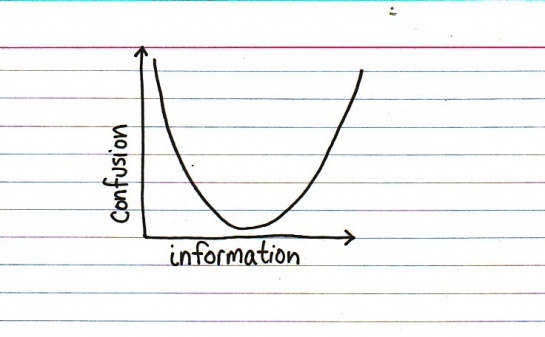 Information does not always create wisdom or understanding. Whether people have complete or partial information and understanding, they can still follow Jesus. This is a fitting message for our information age.